Sketch of a typical geothermal borehole, whose thermal conductivity differs from that of the surrounding ground. The left pop-out depicts the problem's asymptotic structure and application of sub-annual harmonic excitation. Credit: Miguel Hermanns and Santiago Ibáñez, SIAM Journal on Applied Mathematics. Extreme weather events, water shortages, and other consequences of climate change have challenged—and compromised—energy infrastructure around the world. Increased energy consumption is threatening the longevity of a dependable energy supply, and significant reductions to collective energy usage are necessary to mitigate the continued effects of a warming climate. Most energy sources require fuel and emit greenhouse gases and other forms of air pollution. For example, the heating and cooling of buildings accounts for over 25 percent of the world's energy consumption. In the European Union specifically, buildings are responsible for approximately 40 percent of energy consumption and 36 percent of carbon dioxide emission. Because nearly three-quarters of its buildings are considered energy inefficient, the EU recently updated its Energy Performance of Buildings Directive to require that all newly-constructed buildings be nearly zero-energy by 2021. Sustainable heating, ventilation, and air conditioning (HVAC) systems, such as those that harness low-enthalpy geothermal energy, are needed to achieve the EU's formidable goal. These systems utilize a water-to-water heat pump connected to a geothermal heat exchanger with vertical boreholes (deep, narrow holes in the ground). The boreholes are equipped with coaxial or U-shaped pipes, which transport a flowing, heat-carrying liquid that exchanges heat with the ground, using the earth as a heat source in the winter and a heat sink in the summer. Such geothermal HVAC systems are only truly renewable if the heat exchanger and heat injection/extraction strategy are designed correctly. Otherwise, the ground's resulting thermal exhaustion hinders the system's performance. In a paper publishing on February 12 in the SIAM Journal on Applied Mathematics, Miguel Hermanns and Santiago Ibáñez use asymptotic expansion techniques to study the harmonic thermal response of vertical geothermal boreholes to sub-annual harmonic excitations. Hermanns' interest in geothermal heat exchange began in 2011, when a Spanish construction company contacted him about performing research and development for the theoretical modeling of geothermal heat exchangers. After reviewing the state of the art, he was hooked. "Geothermal HVAC systems are among the most energy-efficient HVAC solutions available nowadays," Hermanns said. "Their widespread adoption could clearly help in the ongoing fight against climate change." Correct sizing of these heat exchangers is critical when harnessing low-temperature geothermal energy. "This sizing is conducted during the building's design phase using extensive numerical simulations to forecast the thermal response of the geothermal heat exchanger and its surrounding ground for the next 25, 50, or even 100 years of operation," Hermanns said. "If it is too large, the geothermal HVAC system is not economically viable. If it is too small, the expected energy savings are not achieved." For these reasons, fast and accurate theoretical and numerical models are essential. To ensure the efficiency of a geothermal HVAC system, scientists must be familiar with the system's behavior over 50 or even 100 years. Unfortunately, a time-marching method of the governing energy conservation equations is too computationally expensive. Instead, Hermanns and Ibáñez estimate long-term thermal response behavior with a time-periodic approximation—an established design method for geothermal heat exchangers. "To simulate or model so many years of operation is costly and complex," Hermanns said. "But for the correct sizing of geothermal heat exchangers, only the first years of operation are required to evaluate the system's economic viability, and the last years of operation are analyzed to assure its minimum energy efficiency. What happens in between is not that relevant." The authors' method skips the need to simulate extraneous in-between behavior. 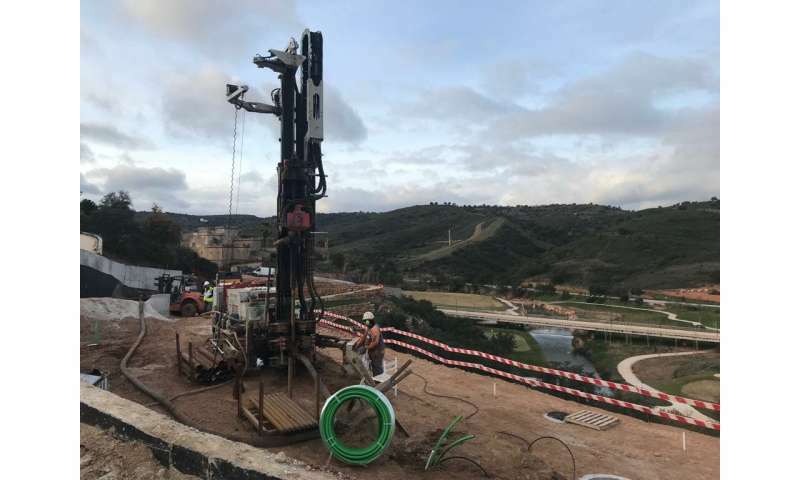 Drilling process of a real-world geothermal borehole at an ongoing construction site in Portugal. Credit: Daniel Muñoz of Sacyr Industrial. 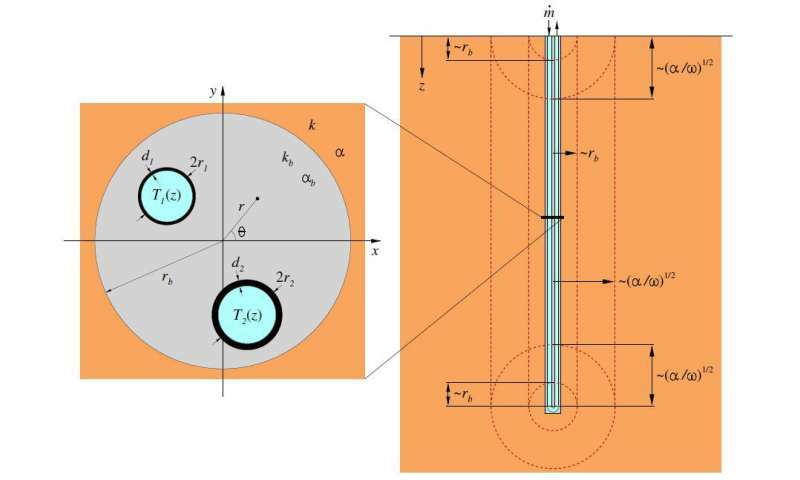 While some theoretical models for the harmonic thermal response of narrow boreholes do exist, these include unrealistic simplifications pertaining to ground size, dimensionality, or the boreholes themselves. Although such assumptions have allowed researchers to study geothermal heat exchangers for 30 years, they are technically inaccurate. "Most of the work done so far on the theoretical modeling of geothermal heat exchangers makes certain assumptions that are not physically correct," Hermanns said. "By avoiding those assumptions, our work is able to surpass the existing models in terms of accuracy, flexibility, and speed, opening the door to new design and optimization possibilities." Hermanns and Ibáñez employ matched asymptotic expansion in search of an accurate approximation that avoids the aforementioned assumptions. Having used asymptotic expansion when theoretically modeling combustion as a Ph.D. student in aerospace engineering, Hermanns was already familiar with the technique. "All of the problems presented large disparities in time and length scales, which were exploited using asymptotic expansion," he said. "Thus, when I was confronted with the heat transfer problem present in geothermal heat exchangers, I naturally resorted to asymptotic expansion techniques, as I was fully aware of their potential." Formulating the heat transfer problem in the rich asymptotic structure of their analysis delivers three systems of equations. These equations indicate that neither apparent temperature nor heat injection rate are constant along the boreholes—an important development, as most existing models assume constancy in one or the other. However, the authors' investigation goes beyond the search for models that describe different regimes of operation. They also seek insight into the physical problem itself, which Hermanns considers more valuable. "In this sense, we have been able to put a lot of consistency and order in the state of the art, giving mathematical explanations for many assumptions and modeling decisions found in the literature," he said. "These were correct, which is important to highlight, but were developed by intuition." Ultimately, Hermanns and Ibáñez's asymptotic expansion yields theoretical models that accurately reproduce the temperature distributions along the heat exchangers' boreholes. This work is part of a larger series of articles (currently in review) that extends harmonic response analysis to complete geothermal exchangers with many thermally-interacting boreholes. "This is a huge leap forward in our roadmap," Hermanns said. "It shows that the proposed modeling approach leads to useful results for real-world configurations."